Of Ocean, tossing on his restless bed! Oft closed, with sudden flashings, o'er the dead! The sunshine of our youth, our manhood's pride! Upon the tranquil Thames, and cheers the sinking scene. The magnificent collection of buildings by the Thames that is Greenwich Hospital was designed by Christopher Wren. Construction was started in 1696 and completed in 1712. 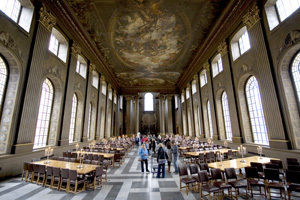 It closed in 1869 and soon after became the Royal Naval College, a purpose it served until 1998. It is now the centrepiece of the UNESCO World Heritage site known as Maritime Greenwich.